Last week I met some distant Rueck cousins on the Internet and we shared some Rueck information and photos. These cousins descend from Friedrich Rueck, the brother of my great-grandmother Christine (Rueck) Miller. They were both children of Jacob and Maria (Gross) Rueck. I decided to look through my Rueck information again. I have quite a few unfinished notes in this family line. Jacob Rueck was born 24 December 1828 in Appensee, in the governing district of Crailsheim, Württemberg. Maria Regina Gross was born 22 July 1833 in Hassfelden, Württemberg. They married 19 June 1855. 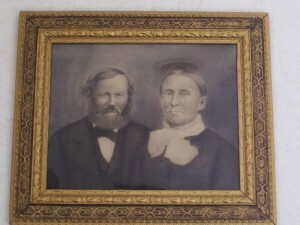 The couple had the following children: Johann George (1856-1925), Jacob Jr. (1857-1935), Christina (1858-1945), Johann “Friedrich” (1860-1924), Michael (1862-1862), Margaretta (1863-1864), Johannes (1865-1865), Catherina (1866-1955), David (1868-1956), Regina (1870-1951), Carl (1872-1933), and Caroline Rosina (1874-1875). Four of their twelve children died in infancy in Germany but the rest of the children immigrated to America. Jacob and his wife and children probably immigrated together. We believe they arrived in New York in 1880. However, Jacob Jr. gave 1881 as his date of immigration when he was enumerated in the 1900 census. He may have come to America a year later than the rest of the family. If the Ruecks had only immigrated a year or two earlier they would have been enumerated in the 1880 census. As it is, I have not found them in this census. By 1881 the Jacob Rueck family had settled in Van Wert County, Ohio. Jacob purchased 120 acres of farmland east of the village of Willshire, in Willshire Township. His farm was between Willshire and the Schumm settlement. It was probably no coincidence that the Ruecks settled in the Schumm area. Most immigrants moved to where relatives or friends from the old country had already settled. The Schumms were from Ruppertshoffen and the towns of Appensee and Hassfleden are only a few miles away. New immigrants probably knew where the German Lutheran settlements were in the new country. Maybe they knew someone who knew someone that had already settled in the area. 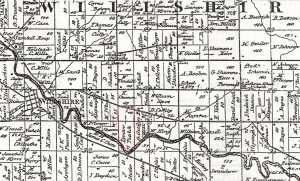 Below is part of an 1872 Map of Willshire Township. I have outlined in red the property that Jacob Rueck once owned. 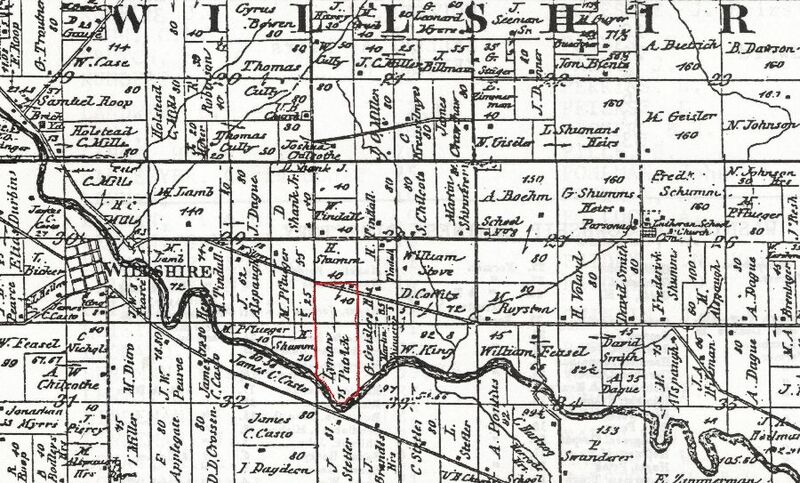 1872 Map of Willshire Township showing location of Jacob Rueck's farm. The parcels are just a couple miles east of Willshire. What is now State Route 81 cuts through the north part of the farm. Three years later, on 3 October 1884, Jacob sold his 120 acres to Martin Schinnerer for $4500. (Van Wert County Recorder’s Office, Deeds, Vol. 26:130-131) There were two Martin Schinnerers at that time but this was probably the brother of my great-great-grandfather, Friedrich Schinnerer. It is a small world. While living in the Willshire/Schumm area the Ruecks attended Zion Lutheran Church at Schumm. According to the records at Zion two of Jacob’s children were confirmed at Zion. David Rueck was confirmed on Palm Sunday, April 1882 and Regina Christine Rueck was confirmed on Palm Sunday, April 1884. Confirmation age was about 14 years and both of them would have about 14 years old at the time. Unfortunately I do not have copies of Zion’s communion records. They would probably give a good indication of when the Ruecks arrived in the area, what family members were here and when they left the area. Also in the records at Zion, Schumm: Jacob Miller, a widower from Mercer County, married Christine Rueck, of Zion’s parish, on 9 November 1882 at the home of the bride’s parents. Jacob would have lived about seven or eight miles from the Rueck home. I wonder how he and Christine met? It also appears that they married before the rest of Christine’s family moved out west. 16x20 charcoal portrait of Jacob and Regina (Gross) Rueck that hangs in my office. After Jacob Rueck sold his farm to Martin Schinnerer everyone in the family but Christine moved westward. Christine stayed in Ohio because she had married Jacob Miller. They lived about two miles north of Chattanooga. Thought your article was so interesting. My grandfather game over in 1923 at age 20 through Ellis Island and settled in Chicago, Hermann Rueck. I believe he had 4 brothers that also came over… do you think they could be related to your Ruecks? I honestly do not know if they would be related. What part of Germany were your Ruecks from? Some of my relatives have visited Rueck relatives in Germany. I’ll have to ask them they know of any Ruecks that immigrated more recently. have either one of you located the native town of Hermann and his 4 brothers yet? would be very interesting to compare notes and share data. Hello Karen, my name is Lynn Fent, I am the son of Frances Wilma Fent (born Frey) who is the daughter of Samuel Frey and Lena Frey (born Ruck) who was the daughter of Johann Frederick Ruck and Mary Ruck (born Prollock), Johann was one of Jacob’s sons. Samuel and Lena lived in Logan County, Oklahoma. My understanding from your last post is that Jacob was the son of Georg Ruck and Rosina Lober. Is that correct? What is the relationship of Johann Georg Ruck (1752o-1784) to the other individuals. I am also married to Joyce Lowrie-Layman’s cousing. Thanks for writing and I am always glad to hear from distant family members. My aunt got this Rueck genealogy information years ago, from Rueck family members she was visiting in Germany. 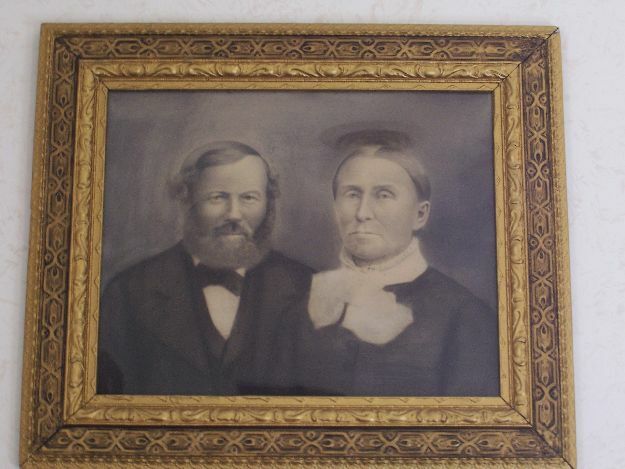 According to what she passed on, yes, Jacob Rueck (1828-1918) (died in Oregon) was the son of Georg Rueck (1787-1870) and Rosina Barbara (Lober)(1795-1866). Georg Rueck was the son of Johann Georg Rueck (1752-?) and Eva Catrina (Roek) (1765-?). I show that Johann Georg and Eva Catrina married in 1784 and I only have 1 child for them, Georg Rueck (1787-1870). They may have had more. 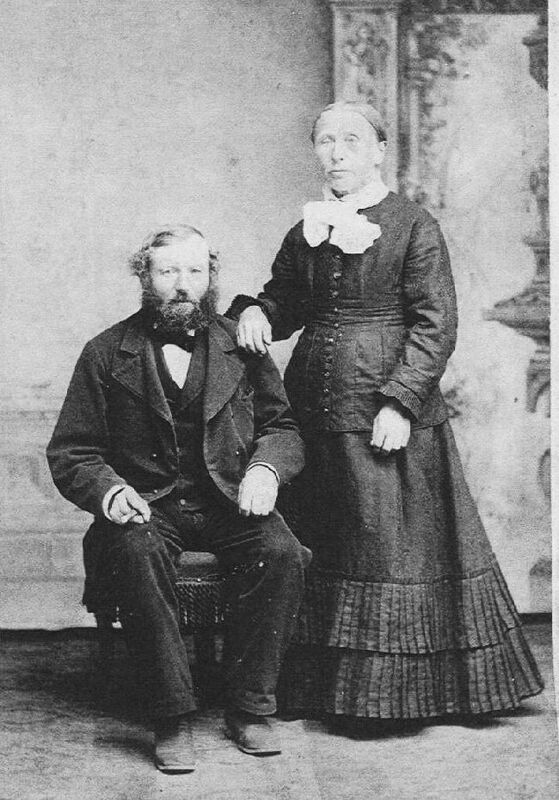 Jacob (1828-1918) immigrated to America and died in Oregon. I believe his siblings died in Germany. I hope this information helps. I will e-mail you privately and get updates on your branch of the family and share information. Thanks for writing!